The history of art is a school subject taught to varying degrees in the National Education. Its aim is to teach works of art that have been made in the past from a technical, historical, contextual and symbolic point of view. She endeavors to highlight the artists, their lives, their opinions and how they emerge through their works. It also explains the impact of a work on the public in a cultural, demographic or religious context specific to the work. Christ the Redeemer is a world-famous monumental statue, it is normal to find it on the curriculum of most curricula. The rest of this page provides explanations that can usefully be found in a study of this monument, whether for schoolchildren, college students, high school students or students. To each of them to draw from these resources the information that he needs. This criterion consists of studying categories, types, genres, artistic styles, structure or composition. This is probably the least important criterion for Christ the Redeemer. This second criterion concerns the study of materials, materials, tools, supports, instruments, but also the bodily, gestural and instrumental methods and techniques that have been used for its construction. Nor is this criterion the most interesting for Christ the Redeemer. Third criterion in the description of a work, it approaches messages (sent, received, or interpreted), senses (common, general, particular, variations of meaning in time and space), code (meaning / signified), reception, interpretation, decoding and decryption. This criterion is probably the most important concerning Christ the Redeemer. The last criterion of study leads us to understand the function, the use, the categories of recipients and users, the destination, the use, the transformation, the rejections, or the diversions of the work. This part is quite important but it does not need a particularly long development in regards to Christ the Redeemer. Finally, it is important to give one's feelings about the work, what it evokes for oneself. This part being purely subjective, it can not be developed here, and yet I provide you with a short text giving my own feelings on the statue. It is impossible to make a dossier, a duty, a text on Christ the Redeemer of Rio if we do not begin with a short description of the context in which it was built, its author and the work itself. Christ the Redeemer of Rio is a monumental statue located at the top of the Corcovado, one of the peaks of the Brazilian city of Rio de Janeiro. Visible to the city, it has a strong religious role of protecting the city but also a symbolic role of representation of Brazil. It was realized by Heitor da Silva Costa, Brazilian engineer who had it made by the Frenchman Paul Landowski. The first stone was laid on April 4, 1922, and the inauguration took place on October 12, 1931. The reason for which it was commissioned is classic for this period, it was officially a commemoration of the centenary of the Brazilian Republic, but the reason was to increase the strength of the Catholic religion in Brazil. Besides, the project will be largely promoted, followed and inaugurated by the Catholic Church. The most significant event in the construction of the statue was the lack of experience of the constructor da Silva Costa, who had proposed an unattainable statue and could not define an acceptable project. It was thus surrounded by a team of European specialists that he succeeded in realizing it concretely, one redefining it, the other constructing it, the third choosing the materials, another calculating the forces involved, a last drawing the face, etc. Since its inauguration this monument has become one of the most visited in Brazil. How does she fit into the works of her time? The context in which the statue of Rio was built is that of a young American republic of a century, during the first half of the twentieth century. At that time the United States was not yet that great power that we know today, Europe still had a dominant position in the world. The artists were mostly European, and every monument erected in the world was the work of one of these French, British, Romanian or Italian artists. Thirty years before, a Frenchman, Auguste Bartholdi, erected the statue of Liberty in the port of New York. This period was the confrontation of the great world powers to establish their colonial dominions, military, cultural or artistic. During the 20/30 years of the twentieth century, this confrontation had already largely disappeared, the powers having already reached a precarious but reliable balance. The construction of Christ the Redeemer was therefore not due to the desire to assert the supremacy of Brazil in the World but only to develop Christiannism in this country already largely asquisite to its cause. We can imagine the questions that the builders asked themselves in order to build it: A statue of 30m at the top of the Corcovado seems simpler to make than this famous statue of Liberty, certainly put in the port of New York, but especially high of 50m, to erect on a pedestal as high as it. And yet the difficulties will be far superior to what they were able to believe at the outset, proof that the construction of this statue was to be considered obvious to be constructed when compared to other works of the time. One can also make a stop on the artistic style. The 1930s are those of the Art Deco style, a style that is found almost everywhere ... in the world. It's amazing when you think of finding art-deco buildings on the Miami coastline, in the seaside resorts of Normandy and on buildings in Saigon. The fact that an artistic style has developed in such a tentacular way is surprising, but it is a proof of the improvement in the international traffic of people of the early twentieth century, an improvement that allowed the circulation of ideas as well as goods and which brought to the four corners of the planet this particular style that is art deco. To the point that it will be used by the designer of the statue of Rio. Today, Christ the Redeemer is the most imposing monumental art-deco statue in the world. The statue of the redeeming Christ is part of the domain of statuary, as its name suggests. It is a statue in the round, a term designating a sculpture that is neither bas-relief nor high relief. One can go around a statue in the round, which is not the case for the other two types of statues. The artistic style chosen is art deco, as indicated above. It is an essentially architectural artistic current that is characterized by a purification and a softening of forms. "Purification" means that the artist will limit the number of traits on the work, he will consider it in the form of massive blocks distinct from each other. "Softening" means that he will use straight lines and regular curves to make his work schematic. Today we recognize the art-deco style with its long vertical or horizontal lines embellished with lines in semicircles. Christ the Redeemer followed the style of the time, while on the contrary his New York sister adopted the neo-classical style that was in force in the 18th century and until 1830. The Statue of Liberty built in an old style (it was inaugurated in 1886). Otherwise a more general bridge of view Christ the Redeemer of Rio is what is called a "titanic statue", or "monumental statue". It is 30m high and perched on a pedestal 8m high. Rather thin, she represents Christ with her arms outstretched as a sign of rallying. This position puts forth a will of the artist to make a static statue, without movement. Christ seems stopped, perfectly still. The art-deco style accentuates this impression of immobility since it simplifies the features of Christ, the contemplator does not see the folds of the gown for example, folds that can give the impression of movement. He also does not see the precise features of the face, which also could give an impression of movement. The location of the statue also participates in its form as it is placed at the top of the Corcovado, one of the many peaks of Rio. But not just any, the closest to the city, the one that has a vertical wall. Putting the statue up there makes it visible from all over the city. The shape of the statue, arm in cross, supperposes to the ogival form of Corcovado, forming a set that the Cariocas see to the daily. The analysis of techniques for Christ the Redeemer is a little longer than the others. He describes how the statue was actually made. One can easily imagine, a project of this magnitude requires many skills. There are those necessary for the establishment of the project (draftsman for example) and those that have been implemented for its execution. Finally, some other skills are required for its maintenance. It may seem unbelievable, but the project presented by Heitor da Silva Costa, a Brazilian engineer who won the competition for the construction of a monument for the 100th anniversary of the Republic of Brazil, was in the form of a sketch, some documents explaining how to make the statue that appeared on this copy. In comparison, the Eiffel Tower project consisted of thousands of pages, technical drawings and other worksheets. The skills necessary to obtain the agreement were reduced, it was only necessary to have the artistic soul and to propose a coherent drawing. On the other hand, from the moment of acceptance everything is complicated since the technical realization of such a statue could not be done, after various simulations. Da Silva Costa went to Europe to meet different people to help him. The statue of Christ the Redeemer is therefore the result of teamwork. The final drawing was made by the artist Carlos Oswald, it is this one that will really be made. The choice of material came at that time, since a material capable of supporting enormous forces was needed, the arms of Christ being particularly heavy. Da Silva Costa chooses concrete. This material was modern in the 1930s, if it was already quite popular there were few people who were able to dose it correctly, to understand the chemical mechanisms behind the cement solidification. So it was necessary to bring in the right person for that, it was Albert Caquot, a French engineer who had made a specialty. Christ the Redeemer therefore required skills in calculating the strength of concrete. During construction you have to go to Europe to find the first techniques. Indeed, the statue was first made of clay in a Parisian workshop by Paul Landowski, a French artist. It was first reduced-scale of course, and once made this model was cut into several pieces and reproduced in full size. The next step was to create wooden molds of the correct size. A problem to be highlighted at this time: How to make a mold of a model in clay? The problem was solved by Auguste Bartholdi when he built the statue of Liberty, but it was not this mechanism that was used here. Bartholdi had made a plaster model on a wooden structure and each copper plate was hammered to the ideal shape. At Landowski, the statue of Christ the Redeemer being simpler, he simply created the ex-nihilo mold, that is to say, without a starting point that could help him, just by measuring the clay mold. It must be said that the art-deco style of this monument greatly simplifies its structure, quite straight. The face of Christ has been the subject of special attention. It was entrusted to Gheorghe Leonida, a Romanian sculptor, who worked in the same way as Landwski. Once all the molds were made they were embarked on a boat which took them to Rio. There, da Silva Costa took them up to the Corcovado where they were filled with concrete according to Albert Calquot's instructions. Once dry the sections were mounted on top of each other by a large scaffolding mounted at the top of the Corcovado. To mount the building materials as well as the workers at the top there existed, at the time, only two means: The road and the train. It was the train that was chosen. During 4 years this train served only that, it was dedicated to the site. The facing of the statue also required special technical skills: Mosaic. Indeed, if one looks closely at it, one finds that it is covered with a large quantity of triangular stones - for the most part - of a uniform color. It is steatite. It is a stone that has the characteristic of being very little subjected to the variations of temperature while remaining a soft rock. This stone was crushed into pieces which were polished before being applied in facing on all the parts of the statue, forming a gigantic mosaic. According to Heitor da Silva Costa, it was the first time that the technique of mosaic was applied to a monumental statue. The pieces were broken by hand by an army of women, who sometimes marked words on the back of the pieces so that their texts were forever caught in the robe of Christ. The use of this stone has had a negative effect nowadays. During the last major renovation, in 2010 it was found that the quarry from which the stones were pulled was exhausted, so it was impossible to find exactly the same color. Similar stones were used, with a slightly different color, but this difference is so small that it is impossible to distinguish with the naked eye when looking at the whole of the statue. Nowadays it is much easier to intervene on the Redeemer Chirst in Rio. The renovation techniques were mostly used during the restoration of the monument in 2010. On this occasion the statue was completely studied. Many of the facing stones were replaced, but the structure of the monument was not a cause for concern. The technical interventions on this statue consist essentially of repairing it when the lightning touches it, which happens several times a year. What does Christ the Redeemer mean? What message is there? These are the questions to which this party must answer. This part contains few elements because the meaning of this statue is obvious, it contains no hidden messages. It is a statue with evangelizing vocation, it was designed to highlight the Christian faith with the people of Rio. More precisely, it is a Catholic statue. In this regard, during its construction, a wave of protests was born to mark the disapproval of the Protestant community, but this one quickly calmed down. It must be said that the Catholic community is much larger in Rio, so the Protestants were drowned in the mass, and the beauty of the statue allowed its acceptance in the carioca landscape. The position and name of the statue go hand in hand. The "Redeemer Christ" is a Christ who bestows his redemption on the people. The gesture of opening your arms as a sign of welcome is linked to redemption. Christ welcomes and forgives sinners. His inexpressive face increases the mysticity of the statue, it has a stern and neutral air at the same time. It is all the art of the Romanian artist Gheorghe Leonida to have achieved this result. Moreover the art-deco style, a refined style, also increases the sensation of being in relation with a superior being. The situation of the statue also favors the mysticism of the monument. It is located on the Corcovado, one of the highest peaks of Rio, but also one of the closest to the city. At the top of such a needle Christ seems to dominate the city, still an attitude peculiar to religion. Finally, the last proof of the religious attribution of this statue, it must be known that it is on a base 8m high (which allows it to dominate the crowd even when it is at its feet) containing a chapel, the chapel of Our Lady of Apariceda. This chapel is always consecrated and there are regular services. To make an analysis of the usages amounts to raising the question of the usefulness of the work. Here, what is the use of the statue of Christ the Redeemer? In fact the answer will depend a lot on where we are, and its relationship to the Catholic religion. 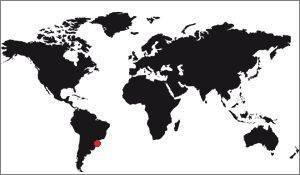 In Brazil the Catholic faith is very important, and globalization causes a mixing of people, and therefore of cultures. Confronted like almost everywhere in the world with the diversity of society, Christ the redeemer has a role of beacon recalling that the creation of the Brazilian Republic was made on the basis of the catholic religion. The monument was built to strengthen faith in the country, it still has this role. Indeed, on the anniversary of the monument, for his 80 years, several copies were made of Christ the Redeemer (of reduced scale, of course) and sent to the world to promote the faith. One of these copies was very well-known at the entrance of Notre Dame Cathedral, during a few weeks. It is interesting to note the popularity of a monument through the number of replicas that are made in the world. No surprise, for Christ the Redeemer this number is very high, and they are found mostly in South America. Of course this is not the only one. For non-believers, the monument is the symbol of the city of Rio, Brazil and a wider view of South America. And curiously, it is the symbol of Rio which is the least prevalent since the city has other equally important symbols, but which do not have symbols values ​​across the country: Sugar loaf for example, Copacabana beach or Ipanema or even the Maracana stadium, world famous but which can not claim to be the symbol of Brazil. Against Christ the Redeemer is without doubt. It is used to schematize this country abroad, systematically. And if we want to expand the territory and choose a symbol of South America, we will inevitably fall on it, with the Eiffel Tower to symbolize Europe and the Statue of Liberty for North America, for example. Now let us ask the question of the recipient: To whom is this monument intended. Here again there is no surprise, the monument is primarily intended for Catholics, the purpose being to strengthen their faith. But apart from that, as it has symbolic value, the city of Rio has organized visits since its construction, and nowadays it can be said that the monument is mainly intended for tourists visiting the city of Rio. The proportion of locals visiting it is very low, it is really the foreigners who organize their ascent on the spot. The message is simple, but it depends on the vision of the Catholic faith: For believers, it is a monument intended to show the power of the Catholic religion, for the non-believers. 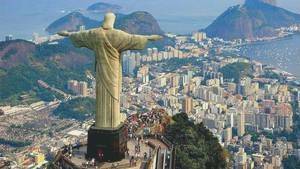 -croyants, it is rather a tourist symbol of Rio. It is always difficult to give guidelines for studying the statue when it comes to giving one's personal feeling, simply because if it is personal, the feeling can not be reproduced as such for others. Nevertheless, I venture to write here the opposite impressions which spring from the study of the statue. First of all, the position of the statue, its location, its static state and even its art-deco style, purified, renders this work timeless, giving it a mystical force that crosses time. To contemplate it gives the same sensation as what one could feel the inhabitants of Rio in the thirties. This calm, this serenity is approximately identical to that of the Statue of Liberty, in New York. Only the mystical dimension differentiates it from the redeeming Christ. It is, for example, the opposite of the "African Renaissance", another monumental statue 52m high (in Senegal,) which shows a dynamic assumed and successful. Description of Christ the Redeemer. Copies of the Christ the Redeemer.